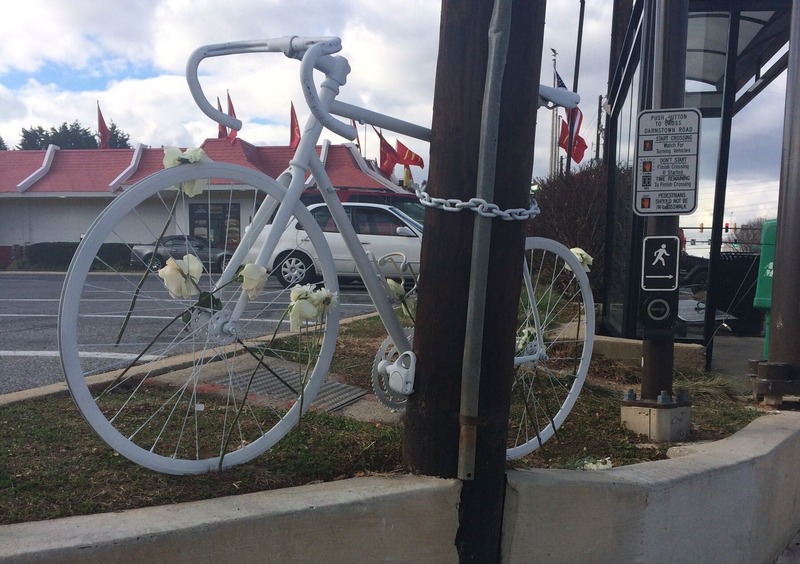 The ghost bike placed in Gaithersburg in memory of Andrew Malizio. Last week was a grim one on the roads in the Maryland suburbs. A driver killed Andrew Gerard Malizio, on Route 28 in Gaithersburg while making a left turn. Less than two days prior, a driver killed a cyclist in Lanham, then left the scene. These deaths are tragic, and they are unacceptable. Vision Zero, developed in Sweden and recently adopted in New York City, is a robust set of changes to transportation policy, road design, and law enforcement designed to eliminate traffic fatalities. It is based on the principle that no one should die on our roads. Period. I write to you both because last weekend, each of your counties saw the death of a person bicycling on its streets. While the details of the circumstances of these crashes are unknown, we know that each death is a tragedy. As WABA awaits more details in the hope that we can offer assistance to the victims’ family and friends—we also hope to learn from these tragedies ways to prevent them from happening in the future. You may be aware that several progressive jurisdictions across the country, including New York City, have adopted “Vision Zero” commitments to work to eliminate traffic deaths and major injuries within a set period of time. Locally, Mayor-Elect Bowser has embraced such a commitment for District of Columbia. In the wake of these tragic deaths, I ask each of you to consider your county’s commitment to Vision Zero, and to the principle that every human life is valuable and should be protected in our policy decisions, in our transportation designs, and in our enforcement priorities. As an organization representing thousands of bicyclists in Montgomery and Prince George’s Counties, WABA is committed to advocating for safe streets for all people who bike. We will continue to work in your counties to promote infrastructure, enforcement, and education programming that keep people safe. I challenge you to truly commit to operating your government in a way that values the life of every individual on the roadways and aligns its priorities ensure human safety over vehicular speed. I challenge you to adopt a Vision Zero approach to protecting the lives of all people—whether driving, biking, walking, or otherwise using the county’s roadways. Every life matters. This weekend serves as a sad reminder that our public policy choices do not yet fully reflect that principle. WABA, and I, look forward to partnering with you to do the work to eliminate roadway deaths in Prince George’s and Montgomery Counties. In the next year, we’ll be talking more about Vision Zero. Stay tuned. Topics: Uncategorized. Tags: Montgomery County, Prince George's County, vision zero.